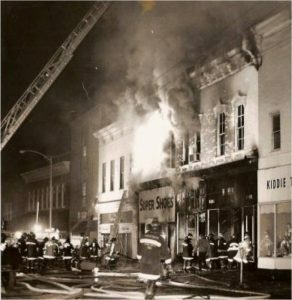 On This Day In Frostburg Fire History, One Of The Largest Downtown Fires Occurred! A fire which raged for nearly four hours before being brought under control, destroyed three Frostburg Main Street business places, damaged another and caused smoke or water damage in four others yesterday. Residents residing above the properties were evacuated and none was injured. More than 170 firemen from 10 companies battled the blaze and three firemen were injured or suffered smoke inhalation. Anthony Wayne Sullivan, of shaft volunteer fire company, was treated at Frostburg Community Hospital for hand lacerations and dismissed. Michael Shirley of the Frostburg Fire Deptartment was admitted for smoke inhalation. Michael Blanco, a member of the Midland Volunteer Fire Company, was admitted to Sacred Heart Hospital here for observation, suffering from smoke inhalation. His condition was reported as fair. Frostburg had five pieces of equipment and 50 men at the scene; Clarysville, three trucks and 20 men; Corgansville, one truck and 10 men; Mount Savage, one truck and 10 men; Shaft two trucks and 20 men; Midland, two trucks and 20 men; LaVale two trucks and 20 men; Bowling Green two trucks and 20 men, and District 16 which sent seven men to assist. Cumberland Fire Dept. sent its 85-foot aerial (hook and ladder) truck to assist with three men and the LaVale Volunteer Rescue Squad had an ambulance, rescue truck and 10 men on scene. The fire, which reportedly started about 5:35pm in the Frostburg Bakery, gutted the bakery, Hohing’s men’s store and the Super Shoe store. Whitacre’s West, a gift shop, was also damaged by fire. After the fire broke through the west wall of the Whitacre store firemen climbed to the roof of the Hafer’s Store to try to concentrate on containing it and were ultimately successful, but not before one fireman said, the second floor had given away, at least in spots, causing probable serious damage to material on the ground floor of the building. Smoke and water damage was caused to Kiddie Town, Hafer’s Furniture Store, Wheler’s paint and decorating store and Griffith’s, a ladies apparel store. The fire was brought under control at 9pm but continued to smolder. Clouds of smoke erupted from the burned buildings. Mrs. Mabel Fisher, who resided over the bakery, reported the fire. Mrs. Fisher has been retired only since the first of the year. Others evacuated or forced to flee included Mr. and Mrs. Ray Shumake who resided over Whitacre’s; Gilbert Hostettler, bakery owner, who resided in one of the apartments above his business place; Mrs. Dorothy Beall, Miss Annie Carson, Miss Irene Condry and her sister, Miss Margaret Condry, and Mr. and Mrs. Gerald Delaney, all residing over Griffith’s. Those evacuated were being housed by friends and members of their families last night. They escaped with only the clothing they wore, the remainder of their possessions being destroyed or damaged by smoke and water. As the fire raged out of control for nearly 4 hours, dense smoke covered the area. Firemen first on the scene were hampered getting into the bakery because of a short circuit and a 220 volt transformer, which began arcing. The electrical disturbance ceased about 7pm by that time, all three floors of the bakery were involved in flames had spread into Hohing’s and Super Shoes. Super Shoes was the only business open at the time of the fire, sources said. The structure housing super shoes was formerly Wittig’s Bowling Alleys in the rear of the building, which extends to Mechanic Street, had been sheathed in metal siding with a metal roof, with only one window and a door opening into the rear of the storeroom from Mechanic Street. By the time firemen were able to concentrate hoses on the rear of the building, the interior, filled with leather, plastic, rubber and cloth goods was a single mass of flames. For several hours, water being directed into the mass of flames turned to steam almost before it entered the structure. By 7:10pm, Fire Chief John Durst of the Frostburg fire Dept., reported some progress had been made but the fire was far from under control. By that time, 10 fire companies including Cumberland Fire Department, had representatives at the scene. Capt. Ralph Mahaney of the Cumberland Fire Department reported at 7:30pm that there was difficulty with the water pressure on the Mechanic Street side of the fire affected the buildings. At about the same time, the fire broke through the firewall of Whitacre’s West store and was raging on the upper floor of the two-story structure. 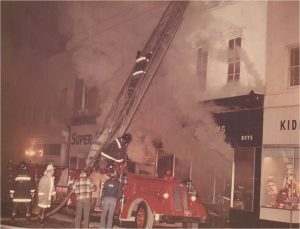 The old building housing the Super Shoe’s store had flames bursting through the walls and the structure was listed as “gone.” The Bowling Green Volunteer Fire Company, which had been on standby was called to the scene and arrived about 7:30pm. Traffic problems and spectators were handled by Frostburg City Police, with eight men on duty, Maryland State Police with seven on duty, and the Allegany Sheriff’s Dept. with four men. Icy conditions posed some problems for firemen but the situation could have been more serious if when had developed or the temperatures dropped suddenly. Mayor Arthur Bond appealed to the public to stay away from the scene to allow firemen to do their job. Allegany County Chapter, American Red Cross, dispatched a canteen truck to the scene and will also aid persons made homeless by the fire. George Hast, chairman of the Red Cross disaster unit, went to the scene to supervise operations. Coffee and sandwiches were served to firefighters by the Princess and Diamond restaurants. The Frostburg Merchants Association, directed by L. Fred Dean and Edward Flanagan, were serving coffee and sandwiches at Saint Michael’s School cafeteria. McDonald’s in LaVale, sent a large quantity of sandwiches to the scene for firemen and other volunteers. First Presbyterian Church, Frostburg, assisted serving coffee and food.